Wholly Kaw This is an amazing Soap! The soap comes in a sturdy white hard plastic tub with a screw on lid. 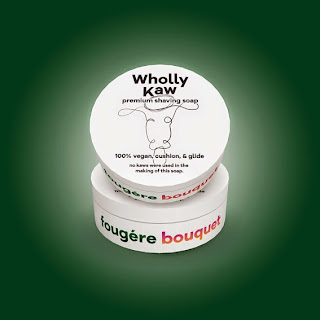 The Wholly Kaw logo looks like a hand drawn cow, which is proudly displayed as part of the label, and is affixed to the top of the lid. On the side of each tub reads the name of the scent it never appears anywhere on the top only the side. This is the only soap I own which is setup like this. In some situations it could be difficult for customers to see which scent he or she is reaching for if they are not visible from the side. The tub has a very wide mouth, which makes it easy to load your brush from. I’ve never had this scent in any other product before so I must say I was floored by it, a complex woodsy scent that will last even after your shave. I even purchased the aftershave I liked it so much. The notes listed are oak moss, lavender and bergamot sandalwood, cedar, tonika bean, musk and ambergris. It took the normal amount of time to product a nice rich creamy lather. As I began to shave my razor would glide on the surface of my face nice and easy. After I was done I lathered again for a second pass against the grain and to my surprise it was like my razor had no blade. I even stopped to take a quick look to verify I did indeed have one. I think it’s good to note that this soap contains no parabens, no chemical sulfates, no animal products, no tallow, no lanolin, and no dyes. This product is 100% Vegan. I always thought that shaving soaps had to have tallow to make them any good. As you can see I was wrong. You really need to try this soap for yourself go to the website and order up some samples.